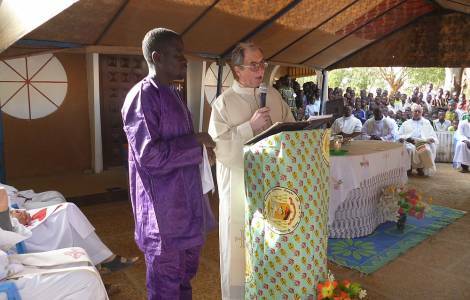 AFRICA/NIGER - A missionary: "We do not know where Fr. Maccalli is, we live in a climate of insecurity"
Niamey (Agenzia Fides) - "Today we live in a climate of insecurity that reigns on the border area with Burkina Faso. Almost every week, there are armed attacks that mainly target the military and law enforcement agencies, and that have already caused dozens of deaths. I had the joy of celebrating the Epiphany in my mission in Makalondi, even if every time I go there I clearly perceive the precarious and insecure situation that one lives. Many people, Christians or non-Christians, come to visit us and always ask us if we have news of Fr. Gigi Maccalli but our answer, unfortunately, has always been the same for four months: we do not know where he is": this is what Father Vito Girotto, of the Society for African Missions (SMA) says to Fides, talking about the situation in the missions in Makalondi and Bomoanga, the former parish of his confrere, Father Gigi Maccalli, kidnapped on 17 September 2018. Girotto reports: "Christmas evening mass was celebrated in the early afternoon of December 24, both in Bomoanga and Makalondi. In the village of Bomoanga the streets are not illuminated at night. Many people took part but in the celebrations of December 25th, immediately after Mass, greetings and best wishes, everyone returned home". The missionary continues: "In Bomoanga, in the church built by Fr. Luigi, there was not an empty seat. But everyone noticed the absence of the faithful of Christian communities from the farthest villages. Information regarding those areas is not very clear: it is said that they are 'controlled areas', but it is not clear which forces control them. People are afraid of being attacked by fanatical groups, who, according to a fundamentalist interpretation of Islam, see Christmas as a pagan event". "After the abduction of Fr. Maccalli and the attacks in November on the city of Makalondi - informs Fr. Girotto - I move from one place to another always escorted by armed police officers. And I have to go and come back to Niamey by the end of the day. On the Saturday before the Epiphany, the fifty-year celebration of the Mission in Makalondi was scheduled, but the Pastoral Council decided to postpone this celebration, which will be said, only after the release of our confrere. A family cannot be part of the feast when an important member is prevented from participating".